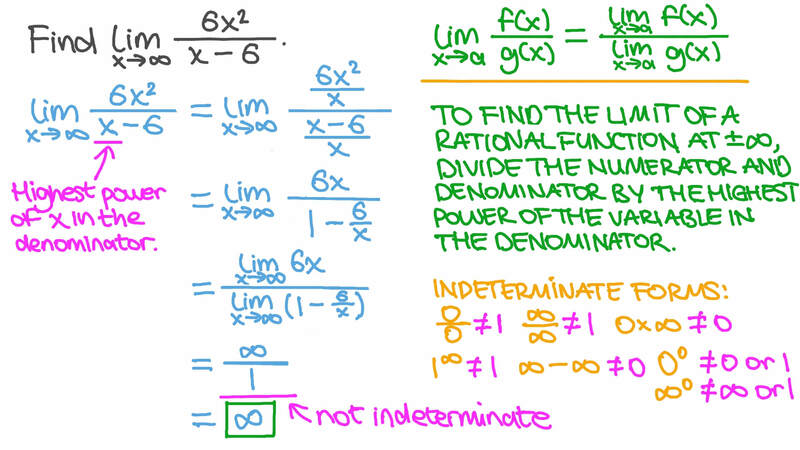 In this lesson, we will learn how to evaluate limits at infinity algebraically for polynomial and rational functions. Find l i m 𝑥 → ∞ 2 6 𝑥 𝑥 − 6 . Find l i m 𝑥 → ∞  1 6 𝑥 + 8 9 𝑥 + 3 . Find l i m 𝑥 → ∞ 2 3 𝑥 + 3 8 𝑥 + 9 𝑥 + 1 . Find l i m 𝑥 → ∞ 2 2  3 𝑥 8 𝑥 + 4 − 7 𝑥 ( 2 𝑥 + 7 )  . Find l i m 𝑥 → ∞ 2 2 − 3 𝑥 − 4 𝑥 + 8 . Find l i m 𝑥 → ∞ 4 3 2 4 3 2 3 𝑥 − 𝑥 − 𝑥 + 3 𝑥 + 2 𝑥 − 8 𝑥 − 𝑥 − 5 𝑥 − 8 . Find l i m 𝑥 → − ∞ 2 3 9 − 8 𝑥 + 6 𝑥 − 2 𝑥 . Consider the polynomial 𝑓 ( 𝑥 ) = 5 𝑥 + 9 𝑥 − 2 𝑥 − 𝑥 + 1 1 4 3 2 . Which of the following is equal to l i m 𝑥 → ∞ 𝑓 ( 𝑥 ) ? Hence, find l i m 𝑥 → ∞ 𝑓 ( 𝑥 ) . Find l i m 𝑥 → ∞ 2 3 2 7 𝑥 + 8 𝑥 + 4 5 𝑥 + 3 𝑥 . Consider the rational function 𝑓 ( 𝑥 ) = 3 𝑥 − 8 𝑥 9 − 2 𝑥 2 2 . Which of the following is equal to l i m 𝑥 → − ∞ 𝑓 ( 𝑥 ) ? Find l i m 𝑥 → − ∞ 𝑓 ( 𝑥 ) . 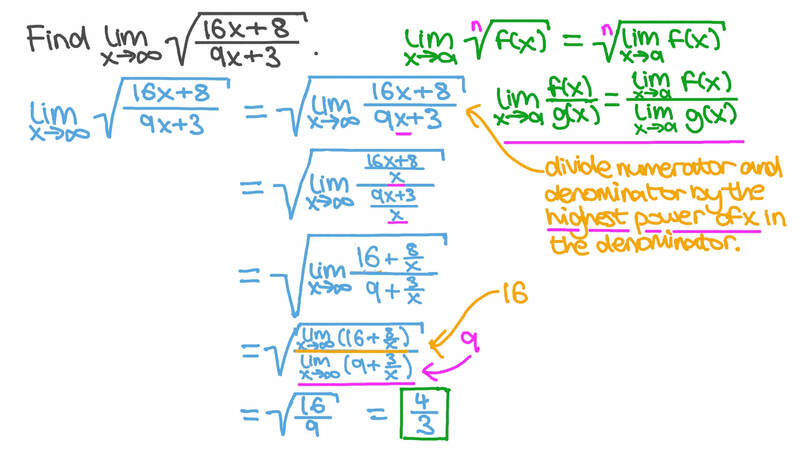 Find the limit of the sequence whose terms are given by . AThere is no limit; the sequence tends to . CThere is no limit; the sequence tends to . Consider the sequence ( 𝑎 )  ∞    given by 𝑎 = 2 𝑛 + 3 5 𝑛 + 6 𝑛     . State the first 5 terms of the sequence. If necessary, round your answers to 3 decimal places. Find the limit of the sequence, if it exists. Determine l i m 𝑥 → ∞ 3 2 2 ( − 5 𝑥 + 4 ) ( 2 𝑥 + 4 ) ( 𝑥 + 2 ) ( 5 𝑥 + 1 ) . Determine l i m 𝑥 → ∞ 2 2 2 2  5 𝑥 + 3  ( 𝑥 − 5 ) ( 4 𝑥 − 3 𝑥 ) , if it exists. E The limit does not exist. Find l i m 𝑥 → ∞ 2 𝑥  √ 3 6 𝑥 + 3 𝑥 + 3 − 3 𝑥  . Determine l i m 𝑥 → ∞ 2 2  √ 6 4 𝑥 + 3 𝑥 + 4 − √ 4 𝑥 + 2 𝑥  . Find l i m 𝑛 → ∞ 5 5 5 5 𝑛   𝑎 + 1 𝑛  − 𝑎  . Find the values of 𝑎 and 𝑏 , given that l i m  → ∞ 𝑓 ( 𝑥 ) = − 4 and l i m  →  𝑓 ( 𝑥 ) = 5 , where 𝑓 ( 𝑥 ) = − 𝑎 𝑥 − 5 4 𝑏 𝑥 − 𝑥 + 4   . Determine l i m 𝑥 → ∞ 3 2 3 2 𝑥 − 𝑥 − 9 𝑥 + 2 ( − 2 𝑥 + 5 ) . Determine l i m 𝑥 → ∞ 8 𝑥 + 7 6 | 𝑥 | − 2 . Find l i m 𝑥 → ∞ 2 2  4 𝑥 − 3 − 6 𝑥 + 3 + 8 𝑥 − 7 𝑥 + 3 − 9 𝑥 + 5 𝑥 + 5  . If 𝑓 ( 𝑥 ) is a polynomial function of a fifth degrees, and 𝑔 ( 𝑥 ) is a polynomial function of a fourth degrees, find l i m  → ∞  𝑔 ( 𝑥 ) 4 𝑥 𝑓 ( 𝑥 ) . Find l i m 𝑥 → ∞ 4 4  3 𝑥 5 𝑥 − 3 + 2 √ 6  𝑥 . Find the values of 𝑎 and 𝑏 , given that l i m 𝑥 → ∞ 5 6 5 4 5 𝑥 − 2 𝑥 + 3 ( 𝑎 + 4 ) 𝑥 + ( 1 − 𝑏 ) 𝑥 + 5 𝑥 = ∞ .